You are currently browsing the category archive for the ‘Vietnam War’ category. Watching the latest episode of Ken Burns’s Vietnam War saga tonight, Monday, covering the period from mid 1968 to mid 1969, I’m reminded again of how thin the “veneer” was in Presidential politics, as Nixon and Kissinger hustled to kill the fledging Paris peace talks just three days before the November election, tipping the outcome in their favor by promising the Theiu government a better peace deal under a Nixon administration. Of course, that treasonous deal by political aspirant Nixon fell thru, and 20,000, that’s right 20,000, additional Americans died before the war finally ended in 1975. Here’s a section on that from my 2011 essay, All That Glitters, published under auspices of the Chicago Literary Club (to read it all, go to http://www.chilit.org, then “Papers” then “Papers by Author” then initial “E” then hit title of essay). “In the summer of 1968, I learned that indeed I’d be assigned to Vietnam. I wrote to the Information Officer of the Military Assistance Command in Saigon and told him of my military and university training in PR, and asked if I might be posted as an information officer on arrival in late November. “1968 was a turbulent, defining year in America. Martin Luther King was assassinated, then Bobby Kennedy. 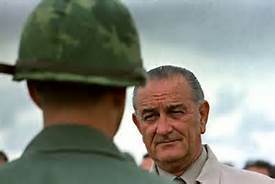 President Johnson had beat anti-war candidate Eugene McCarthy in the New Hampshire Democratic primary, then dropped out of the race as public support for the Vietnam War began to wane following the Tet debacle. Hubert Humphrey became the Democratic candidate, but the Democratic Presidential Convention in Chicago saw Mayor Daly brutally suppress anti-war riots in the streets, perhaps scuttling Humphrey’s chances. My personal essay, “All That Glitters,” relates the story of how Nixon’s cynical political deal to postpone a truce in Vietnam ultimately cost 20,000 Americans lives and perhaps a million more Asians. Now the truth is all out, that covering up Nixon’s deal led to Watergate. An excerpt from Robert Parry’s new article, putting it all together, is below. You can find the full article at www.smirkingchimp.com and search under Robert Parry’s blog. My essay can be found at www.chilit.org, and search under my essay title. “A favorite saying of Official Washington is that “the cover-up is worse than the crime.” But that presupposes you accurately understand what the crime was. And, in the case of the two major U.S. government scandals of the last third of the Twentieth Century – Watergate and Iran-Contra – that doesn’t seem to be the case. “Indeed, newly disclosed documents have put old evidence into a sharply different light and suggest that history has substantially miswritten the two scandals by failing to understand that they actually were sequels to earlier scandals that were far worse. Watergate and Iran-Contra were, in part at least, extensions of the original crimes, which involved dirty dealings to secure the immense power of the presidency. “In the case of Watergate – the foiled Republican break-in at the Democratic National Committee in June 1972 and Richard Nixon’s botched cover-up leading to his resignation in August 1974 – the evidence is now clear that Nixon created the Watergate burglars out of his panic that the Democrats might possess a file on his sabotage of Vietnam peace talks in 1968. “Shortly after Nixon took office in 1969, FBI Director J. Edgar Hoover informed him of the existence of the file containing national security wiretaps documenting how Nixon’s emissaries had gone behind President Lyndon Johnson’s back to convince the South Vietnamese government to boycott the Paris Peace Talks, which were close to ending the Vietnam War in fall 1968. “The disruption of Johnson’s peace talks then enabled Nixon to hang on for a narrow victory over Democrat Hubert Humphrey. However, as the new President was taking steps in 1969 to extend the war another four-plus years, he sensed the threat from the wiretap file and ordered two of his top aides, chief of staff H.R. “Bob” Haldeman and National Security Advisor Henry Kissinger, to locate it. But they couldn’t find the file. “Rostow labeled the file “The ‘X’ Envelope” and kept it in his possession, although having left government, he had no legal right to possess the highly classified documents, many of which were stamped “Top Secret.” Johnson had instructed Rostow to retain the papers as long as he, Johnson, was alive and then afterwards to decide what to do with them. “So, the missing file remained a troubling mystery inside Nixon’s White House, but Nixon still lived up to his pre-election agreement with South Vietnamese President Nguyen van Thieu to extend U.S. military participation in the war with the goal of getting the South Vietnamese a better outcome than they would have received from Johnson in 1968.